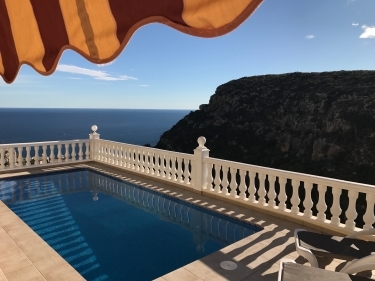 A truly stunning location on the Costa Blanca, this exclusive and immaculate villa is situated in the sought-after area of Cumbre del Sol, and offers you spectacular front-line sea and mountain views. South-facing and beautifully appointed with top of the range furnishings - no expense has been spared to provide every imaginable comfort. 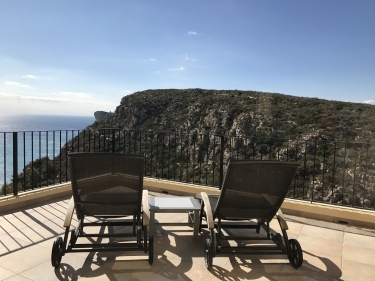 Located conveniently for access from both Alicante and Valencia airports mid-way between the port of Moraira with it's picturesque marina and the resort town of Javea, Cumbre del Sol also features a private beach which is 5 minutes drive from the Villa. Casa Windlenook was personally designed by the owners to maximise the magnificent views and ensure an exceptional quality experience in a luxury villa suitable for year round stays. Great care and attention has been paid to every detail including south and west facing terraces, private heated swimming pool, air-conditioning and superior quality furnishings throughout. Take a look at our Guest Book on this page for the comments from our previous guests - and there are also over 50 Guest Reviews on our own website www.casawindlenook.com. Indoor living - in the open plan lounge / dining area you just can't get away from the breath-taking views. The picture window and patio doors are designed to maximise light and sea/mountain vistas - you won't want to leave! Facilities include air-conditioning, remote control ceiling fans, designer sofas with headrests and co-ordinated dining suite for 6 people. The HD 3D 40" flat screen TV incorporates Sky Satellite (British and International channels) with full Sports Package, and the Blu-Ray DVD and iPod dock with surround sound all add to your entertainment options. We supply 3D DVDs and 3D glasses - so enjoy 'going to the movies' at Casa Windlenook! Wi-Fi is available throughout the villa - even check your emails by the pool! For wintertime, the contemporary gas fire adds that extra cosy touch - this home is designed for year-round comfort. The kitchen is fully equipped with all the utensils and gadgets you may need - including a Nespresso coffee machine, Aeroccino (milk frother) and NutriBullet juicer. Outdoor living - upper and lower terraces include a 4m x 4m covered terraced (Naya) - for when the sun gets a little too much! - and are designed to make the most of the south and west aspects for year-round warmth and enjoyment of the fabulous sunsets over the mountains. The lower terrace surrounds the private heated swimming pool with roman steps and poolside shower. NEW for 2018 - we re-tiled and improved the swimming pool terrace so it's now even better for relaxing on your sun lounger and taking in those fabulous views! Reclining chairs and dining furniture along with the Outback Gas BBQ make outdoor living and al-fresco dining a real pleasure. An outdoor heater in the Naya helps extend the winter evenings! Sleeping - all 3 bedrooms have quality Slumberland deluxe divan beds with extra cosy mattress toppers and the very best Egyptian cotton linens and goose feather and down duvets. Air-conditioning / heating and ceiling fans along with plenty of wardrobe space all add to the comfort of your stay. All bedrooms have high speed hair-driers (one less thing to pack! Master bedroom - Spacious room with SuperKing-size bed (6ftx6ft6) and contemporary bathroom with double vanity units and feature glass-walled walk-in shower. Patio doors to upper terrace. Bedroom 2 - King-size bed (5ft x 6ft6), patio doors to lower terrace. Bedroom 3 - Twin beds, patio doors to lower terrace. Bedrooms 2 and 3 share the second shower room with walk-in shower. Our manager will present Casa Windlenook immaculately for your arrival, and is always on hand with help and assistance to ensure your stay is the best that it can be! For further information on the lovely villa and stunning local area please visit our own private website - www.casawindlenook.com. Or get in touch with us using the 'Contact Us' form on the bottom of this page, we'll be happy to help any way we can! Payment is accepted in GBP or Euros by bank transfer or TransferWise, or multiple currencies and credit cards via secure transaction using PayPal. Pricing is fully inclusive of utilities, WiFi, cleaning, linens and laundry. Pool Heating is available upon request at a supplement of £125 per week. Three generations of Teddy Windlenook! Enjoy the fab heated pool! Al fresco dining - with a view! How about this sun lounger with a view? Glamorous pool shower with a view! Indoor dining - with fantastic views! Watching the boats from the terrace! Sunset from the terrace ! Casa Windlenook from the Sea!